Hey pizza fans, your smart watch can now tell you the status of your pizza. 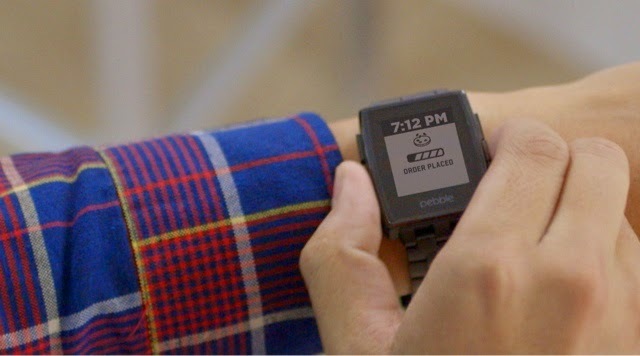 Domino's pizza tracker, which allows customers to trace their order from the time it is taken, baked and out for delivery, will now be available on the Pebble smartwatch. This marks the first time that Domino’s Tracker has been available on any smartwatch device. By loading the app on your watch, and synching with the Domino’s mobile app for either iPhone® or Android™, Domino’s Tracker updates and notifications will show up directly on your watch in real time like Order Placed, Prep, Bake, Quality Check and Out for Delivery. Domino’s Tracker is on Pebble's App Store of 4,000 apps and is available for use starting November 13 and along with the Domino’s mobile app for Android and iPhone. More information can be found at http://pbl.io/dominos. I see this useful as I am prepping a party, with my phone out of the kitchen area and getting everything ready for the party knowing when my pizza order is coming without having to check my phone can be a good thing. Gizmodo reported in October if the tracker can be gamed but too bad Domino's doesn't have the 30 minutes or it's free" rule anymore, I am sure this combo would keep them honest, Let's get ready for holiday season and Super Bowl with this combo.